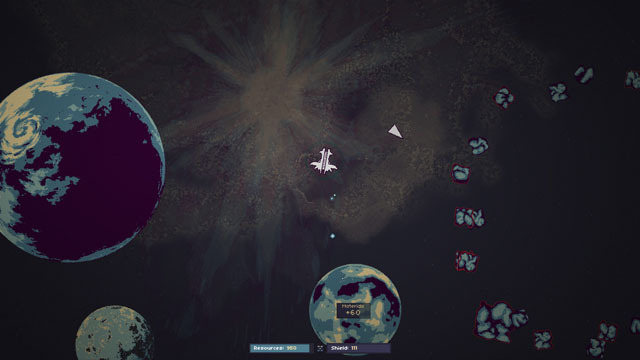 RymdResa is a procedurally-generated space adventure where solitude plays a key role. After his planet is destroyed by a huge asteroid impact, an astronaut sets out across the galaxy to track down clues that might lead the remaining survivors to a new home world. But resources are scarce, and dangers are plenty, with the ship's fuel and shields drawing from the same set of resources, and no weapons to speak of, any interaction may be your last. The first one-third of the game is a roguelike, so failing to save humanity means that you must start your journey again, although some resources do carry over into future sessions. And the longer you stay in space, the more skilled the astronaut becomes... but he is terribly lonely.